“Treating systems have long been one of the most expensive and troublesome of all lease surface equipment. Also, there is little data available to accurately size treating equipment, and as a result, treating equipment is frequently over or undersized,” according to C. Richard Sivalls, of Sivalls Inc., manufacturer of onshore and offshore production equipment since 1947. Treaters are some of the least understood among production equipment and yet one of the most common pieces of equipment used in oil batteries. Contributing to this dichotomy are the many designs of treaters. For the purposes of this article, a treater is defined as a heated, lower-pressure (50-125 psi) vessel which treats mostly oil (typically 70 per cent or more), and some (30 per cent or less) entrained water. It’s hard to see what’s inside a treater, but picture a bottle of Italian salad dressing. If left without alone long enough, you’ll notice that it settles in distinct layers according to the weight of the ingredients. The same thing happens inside a treater. The treater separates oil, water and gas instead. However, a treater accelerates separation by using heat, pressure, and sometimes chemicals and electrical mechanisms. 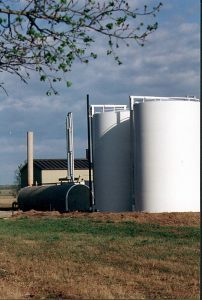 The treater separates streams of gas, pipeline-specification oil and often disposal-quality water. When large amounts of water are produced, a free-water knockout, installed upstream of the treater, helps reduce the treater size requirements by disposing of all of the non-entrained water from the emulsion (free water), and greatly reduces fuel requirements for the treater. A free-water knockout at a conventional oil battery may look similar to treaters, but is designed to handle more water than oil. Typically the firetube (if any) is located higher in the vessel, so the lighter emulsion and oil is heated, not the heavier water residing below. Treaters are designed to handle emulsions in different ways. Emulsions can range from loose to moderate to tight and a laboratory test can determine the specific emulsion qualities. For example, if the emulsion is tight, more heat, residence time, electrostatic grids, coalescing packs and chemicals or a combination of these may be required. Vertical treaters are better suited to loose emulsions with 27 API gravity or lighter oil, and horizontal treaters can handle tougher emulsions better. Horizontal treaters are better suited to larger volumes, of any API gravity and can accept larger firetubes. 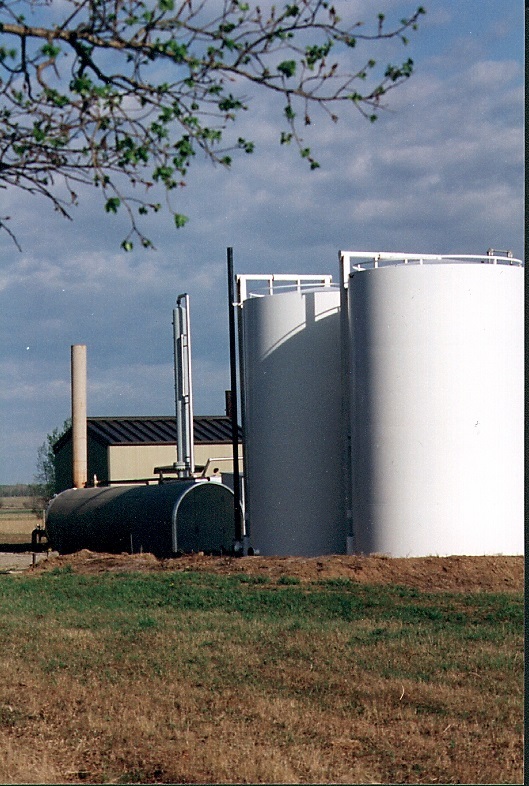 In heavy oil operations, where oil and water can often weigh about the same or even reverse phases but don’t separate easily, horizontal treaters are the only option. In these heavy oil situations, specialized controls may also be required, such as electric interface detecting probes instead of floats. Treaters and Free Water Knockouts deal with water and are therefore need to be protected from potential corrosion damage. Coatings – used to protect against harmful chemicals such as H2S, and CO2. Cathodic protection – uses anodes and offers additional protection against galvanic corrosion. Anodes are used instead of the metal that is similar to the metal used in manufacturing the treater. Thicker vessel shell – add a corrosion allowance. This provides some degree of protection, but increases significantly costs. The effectiveness of corrosion allowance can be debated as typical corrosion does not limit itself to a small amount over a large area. Instead, it tends to focus on a relatively small area. Combination –a combination of coating and anodes is one of the best ways to protect the inside of the treater. Coat the firetubes – be careful the coating doesn’t get damaged during insertion and extraction from the vessel. If there is damage, corrosion has a better opportunity to happen. A Corrosion allowance is often seen as good protection on pressure vessels. Adding 1/16” or 1/8” may have bought you some time, but not as much as a good coating job or good cathodic protection might have provided. It is difficult to understate the importance of coating over corrosion allowance in treaters. It is not unusual for an uncoated treater which has only been used for only a few months to return with fist-sized holes after being exposed to galvanic or CO2 in water-related corrosion when not coated. CO2 demands particular attention as it’s often overseen as an issue due to the fact that it’s not a lethal gas, and therefore not dealt with by the National Association of Corrosion Engineers (NACE), which so diligently demands all these above-mentioned preventative measures when H2S is present. To get your treater to treat you right, involve your equipment vendor to determine the right size and corrosion requirements. If you’re buying used equipment, buy from a vendor who is knowledgeable about treaters. And do the lab work to determine residence time and temperatures required to “break” your specific emulsion. Competent advice and testing will help determine suitability, optimize performance, and produce a best possible payout scenario for your oil battery.